Any time you see a restaurant where people are queuing to get in it’s safe to say the restaurant has: a. really good food or b. really good food and reasonable prices. 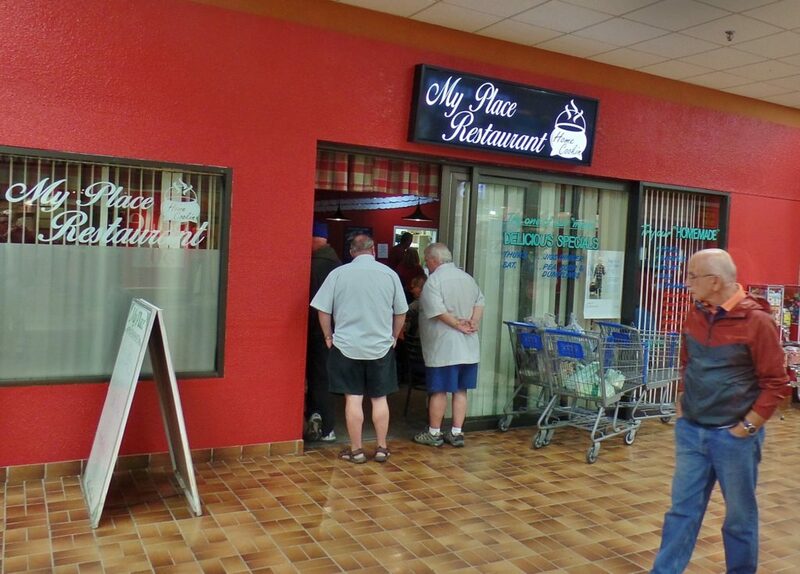 My Place Restaurant in the Trinity Conception Square Mall in Carbonear has b. really good food and reasonable prices. My Place has the image of an old fashioned cast iron caldron or kettle on its signage, which bears the words “home cookin”. In this case the label speaks the truth. Perhaps the word “good” should have been added because, as I keep being reminded by my friends, some of us came from homes where the cooking wasn’t exactly award winning. But, generally, the term home cooking evokes images of mouth watering mac and cheese, baked beans, fruit pies and other dishes for which we feel nostalgic. Owners Gayle and Chantal Dean also operate a My Place take-out counter inside the mall, just around the corner from the main restaurant, opposite Dominion. It’s another sign of the popularity of My Place and its food. When you need extra mall storefront to handle take-away business that’s called a full-throated endorsement. Like most mall rental spaces My Place doesn’t have windows. It’s a dimly lit rectangle with tables and chairs, enough to accommodate between 30 to 40 diners comfortably. Checkerboard tablecloths are held firmly in place by a heavy sheet of clear glass to make cleaning easier and, at the same time, make it easier to maintain the old-fashioned, homey look that checkerboard tablecloths can provide. My Place’s walls feature pictures of traditional rural Newfoundland scenes, which further hammers home the impression that it’s first and foremost a homespun eatery. The entire menu at My Place is pretty homespun, as well as the specials. One day it was homemade baked beans or toutons, on another it was a cold plate. Some days are set aside for regular specials. On Mondays, for example, it’s a wrap with soup of the day and Thursday is Jiggs dinner day. I had turkey soup on my first visit. It contained a strong savour, in aroma and flavour, of turkey, a bird with an almost gamy flavour that I’ve always imagined to be closer in taste to its feral cousins than, say, chicken. My Place’s chicken salad sandwich would have been perfect if someone hadn’t gone all shake, shake, shake with the salt. Fresh bread and good sized cubes of roasted chicken stirred up with onion, celery and mayonnaise made this a delicious sandwich, except for the big dose of you know what. It tasted like the salt (possibly large grain) had been shaken on the filling at the last minute, when the sandwich was being assembled. Less salty but as good was the fresh roasted turkey with lettuce sandwich. Another visit, and a heavier meal, started with a couple of appetizers: cod bites and garden salad. Breaded cubes (bites) of cod, still dripping with cooking oil, arrived in a basket lined with wax paper. The tiny tub of commercial tartar sauce had the tang of factory so I refused to expose the bites to more. 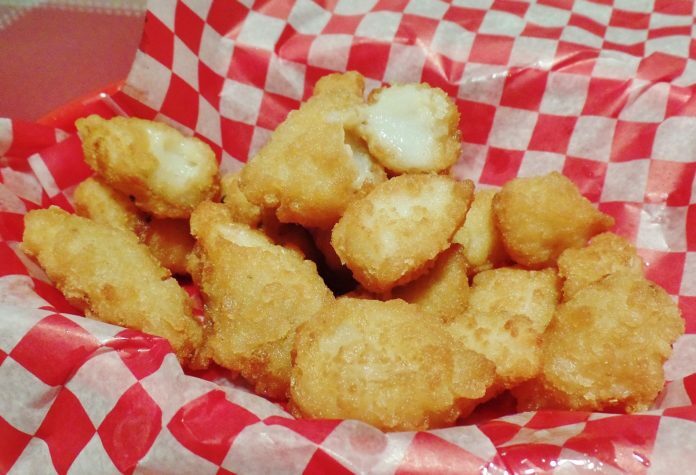 I ate the tender morsels without condiments and they were the better for it. Green (the colour) was conspicuously absent from the garden salad. Blame the iceberg lettuce and its pale colour. Still, the berg did provide some flavour and crispy texture, and a contrast in background for bits of bright red tomato and orange sweet pepper. Store bought Italian dressing gave this standard cafeteria filler some extra zip. Liver, maybe offal in general, is something you either like right off the bat, or not. I don’t think you can acquire a taste for it in the same way it’s possible to acquire a taste for tomatoes. 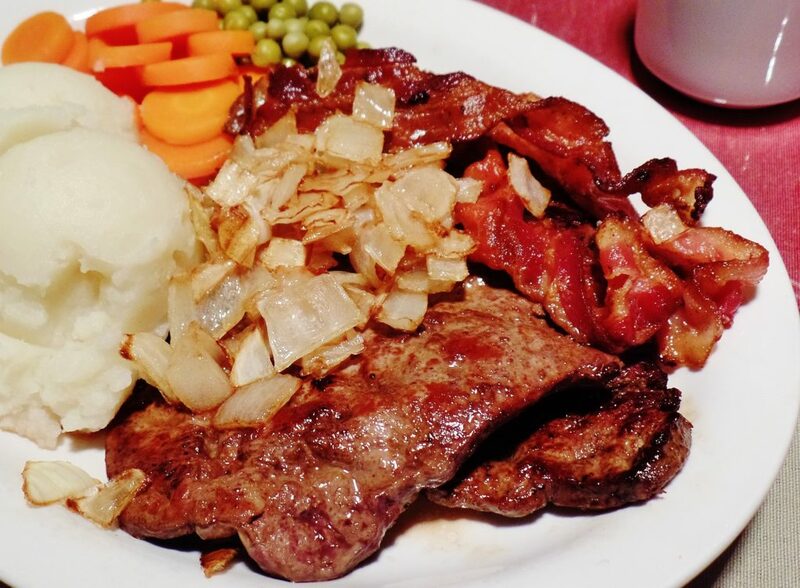 I’ve liked liver since I was a kid, even well done, but I much prefer it lightly cooked. I asked the My Place server (who called everybody “my love”) if I could have the liver lightly cooked. Usually this makes no difference in Newfoundland restaurants because it always comes well-done regardless of any plea for grilling leniency. Surprise, surprise. My Place actually delivered on my request. The liver was indeed lightly cooked and tender. It came with mashed potatoes, sliced carrots and peas (both probably from a tin), fried onions, crispy fried bacon and a fresh roll. It was a flavourful, nostalgia-filled dish. 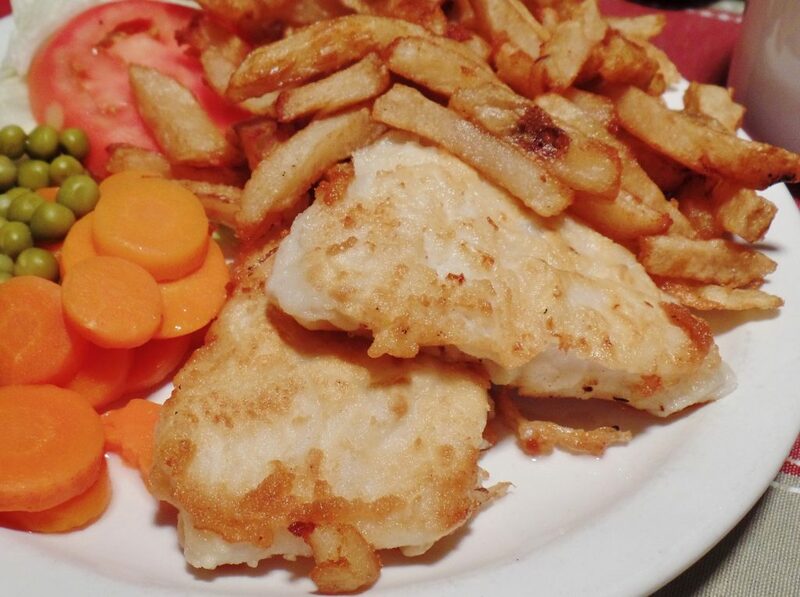 A test for any Newfoundland restaurant is the kind of job it does with pan-fried cod. My Place passed with, as they say, flying colours. Two succulent, golden crusted pieces of cod fillet arrived from the kitchen with toothsome homemade fries, carrots and peas. It was another pleasantly satisfying My Place dish. I’m not surprised My Place had run out of the homemade coconut cream pie by the time I ordered some. It looked mouth watering. So, here’s a tip. If you’re going for lunch get there before noon and order the coconut cream pie when you order everything else. That way they can put a piece aside for you; because, dear reader, the disappointment of missing out on coconut cream pie is almost unbearable. Price Dinner for two with appetizers, tea, tax and tip costs approximately $60. Service Friendly, and you get called “my love” a lot. Ambiance Busy with low lighting and chatter. Open Monday to Wednesday: 9 a.m. to 5:30 p.m. Thursday to Friday: 9 a.m. to 9 p.m. Saturday: 9 a.m. to 5:30 p.m. Beverages My Place offers tea, coffee, milk, juices and a variety of soft drinks. Wheelchair access Some assistance may be needed with outside mall door. My Place has accessible tables but does not have an accessible restroom in the restaurant.